Study Skills provides advice on reading and writing skills, time management, and work planning. It also includes organising and writing essays, research skills, and an introduction to the use of computers. All details of academic conventions are covered. 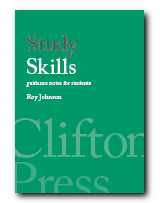 The guidance notes in Study Skills may be used as a study programme or as a handy source of reference. Suitable for students at all levels of study. These notes will help you grasp the essentials of commonly-used techniques in academic study. You can add your own notes and live hyperlinks to personalise your eBook and make it even more interactive. Amazingly good value! Time management How to organise your time for more effective study. Ideas for reducing stress and creating more free time. Reading skills Choose your style of reading to suit the task. Recognising different types of books. Techniques for more effective reading. Concentration Develop your powers of concentration by regular practice in easy stages and use of task-switching. Memory How to use mind maps, mnemonics, visual aids, and good notes to aid your memory. Taking notes How to use abbreviations, diagrams, and good visual layout to write less and record more. Notes from lectures and reading. The importance of sources. Sample lecture notes. Generating ideas How to brainstorm a topic and create the ideas for your assignment. Free thinking and capturing data. Analysing questions How to recognise the key words, instruction terms, and the main concept(s) in a question you have been asked to answer. How to recognise and avoid common problems. Clear thinking Precision and clarity in the use of language, and how to achieve it. Common fallacies of argument, and how to avoid them. Essay planning Analyse the question, generate ideas, choose topics, put them in order, create a plan, find evidence, and choose your best writing strategy. A sample essay plan. Clear writing Use simple sentences and vocabulary, avoid jargon, follow conventional punctuation, and adopt a straightforward tone. Writing essays How to write effective introductions, relevant arguments, and conclusions. The importance of paragraphs in creating the structure of an essay. Presentation How to use footnotes and endnotes, accurate quotations and referencing. The academic conventions for bibliographies. Traditional abbreviations explained. Revision and exams How to use planning, regular practice, and a revision timetable to reduce the stress of exams. Tips for coping in the exam itself. Computers How to use the spell-checker, editing, and text-presentation features of a computer to improve the quality of your writing. Research skills Reading and data recording skills to maximise your research effectiveness. Tutorials How to get the most out of tutorials and seminars by preparing, participating, and recording effectively. How to prepare and deliver a seminar paper. Projects How to plan, structure, and gather evidence for a project or a dissertation. The form of reports and research papers.